It’s now confirmed that a rematch between perhaps the two best pound-for-pound female boxers in the world, and definitely the two best welterweights, Anne Sophie Mathis (26-1, 22 KOs) of France and American Holly Holm (30-2-3, 9 KOs), will take place on June 15 in Albuquerque, New Mexico for Mathis’ World Boxing Federation World Welterweight title. This serves as clear indication that the WBF is already the top sanctioning body for female boxing, and WBF president Howard Goldberg, who will be acting as supervisor for the bout, is delighted about the progress his organization has made in short time: We have many of the absolute best female boxers as our world champions, and it is only fitting that the rematch between these two amazing fighters is for the WBF title. I think it’s outstanding that the WBF is already at the very top when it comes to women’s boxing, but I am not surprised that promoters and boxers are realizing that our title is the title to pursue. 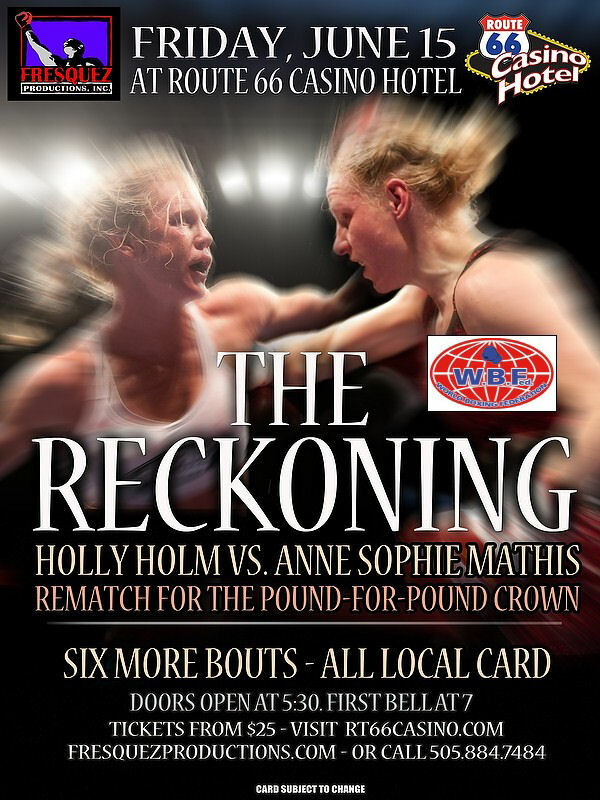 Mathis and Holm had a grueling encounter last December with Mathis winning by seventh round knockout. As their original fight, the rematch, appropriately billed as The Reckoning”, will take place at Route 66 Casino Hotel, and will be promoted by Fresquez Productions. It will be Mathis’ third defense of the WBF World title she won in June of last year.